Interpower is the premier supplier of power system components worldwide. We offer no minimum order or dollar requirements, a 1-week U.S. manufacturing lead-time on non-stock Interpower products, and same day shipments available on stock items. Why observe international product safety requirements? What standards must electronic or electrical equipment meet? What is the ENEC Mark? Who enforces international safety standards? A module simplifies the power entry element by combining multiple functions into a single unit. When selecting a module, the desired functions need to be determined. A module may have from two to five functions. These include: power inlet or outlet, switch, circuit protection, filter, and/or voltage selector. An example of a multi-function power entry module. The power inlet is responsible for bringing electricity into the unit via connection with a detachable cord set. The most common inlet is the IEC 60320 C14, although other IEC 60320 style inlets, such as the C6, C8, and C20, are occasionally offered by some manufacturers. Modules using the C14 inlet are typically specified for applications 10A and below. 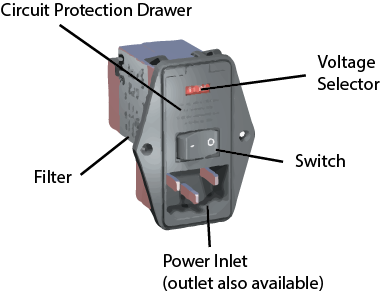 An outlet is an IEC 60320 connection device that provides access to electricity from a power source. Outlets range from 10-20 amps. The switch is used to turn the power on (“│”) and off (“O”) from the module to the rest of the unit. The “│” marking on the module needs to be vertical when mounted. Rocker style switches are the choice of module manufacturers. Some modules use a double-pole, single-throw switch and others use single-pole, single-throw switch. While unlighted switches are the most common, they can be either lighted or unlighted. Circuit protection takes the form of a circuit breaker or a fuse. Both provide current protection to the equipment, reducing the possibility that a short circuit can damage the equipment or harm the user. When a product is being designed for multiple markets, a fuse has an advantage over a circuit breaker in that it’s more cost effective and it’s easier to modify. Fuses are less expensive than circuit breakers. In addition, this allows the customer to change the size of the fuse to match the application, resulting in them being able to use the single module in multiple applications. Circuit breakers installed in modules can limit them to certain applications, based on the size/rating of the breaker. Fuses also have different clearing characteristics (fast-acting, slow blow, etc.) that allow equipment manufacturers to fine tune for their applications. This would not be possible with a pre-installed circuit breaker. Fuse holders and carriers are commonly built into modules so the fuses can be installed to provide circuit protection against abnormal surges and overloads. When determining the amp rating of the fuse, it should not exceed the overall rating of the module. Most modules with fusing capability must be specified as needing either single-fuse or double-fuse capabilities depending on the applicational needs. Some have the ability to be configured either way. Modules do not come with fuses in them. They must be ordered separately. Fuses cannot be included in modules for liability reasons. It is the equipment manufacturer’s responsibility to determine the best fuse for the application and order it for optimal performance. Fuses come in two different sizes. In North America, the standard size is ¼ x 1¼–inch while the common size in international markets is 5 x 20mm. The smaller international fuse is starting to become more prevalent in North America. Some modules can accept both sizes of fuses, while other modules are designed to only accept one specific size fuse. It’s important to check fuse size specifications of any module being considered in order to choose the best one for a specific application. A filter plays an important part in equipment design, especially in high frequency and medical equipment applications. It can remove specified frequencies (RFI/EMI) that can affect equipment operation. A filter helps to provide clean electricity to the equipment. The circuit components of filters are inductors and capacitors. The difference between a standard filter and a medical-grade filter is that capacitors between the circuit conductors have been removed in the medical versions in order to decrease leakage current values. This is important for equipment where leakage current values are tightly controlled by safety standards in order to ensure patient safety. 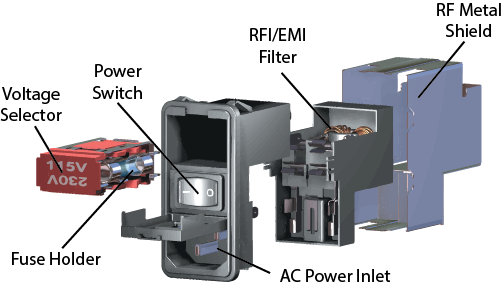 Interpower filtered power entry modules are available with or without a metal shield, typically specified in high frequency applications. An RFI/EMI filter is an electrical circuit that is designed to remove electromagnetic and radio frequency interference (noise) from the equipment. This prevents malfunctions due to interference and also prevents the equipment from radiating noise, which might interfere with other equipment. Whenever specifying a module with a filter, it is necessary for a company to obtain samples to test with one’s application to ensure they will perform as desired. This is because filter performance specifications are based on an industry standard 50 ohm test circuit and certain aspects of an application’s design may alter the way a filter performs when the circuits are connected. Voltage selection allows equipment to be designed and manufactured to operate on approximately 115 or 230VAC. A voltage selector changes voltage by changing connections on the transformer. By changing the selection, this allows the user to define the correct input voltage. Voltage selection changes are made by removing the fuse holder and rotating it. It is important to note that the voltage selector is a specialized switch which works in conjunction with a transformer that is designed into the customer’s equipment. The transformer is not part of the actual module, but it creates alternate circuit paths for the voltage selection process. If the customer has a switched mode power supply (which is any power supply between 90-264V), then a voltage selector is not needed. Hospital-grade equipment must meet special requirements. These requirements place special significance on fusing and filtering when selecting components used in medical equipment. Patient-connected medical equipment can be subjected to low-leakage current requirements. The use of a low-leakage filter in the 5µA range at 250VAC is desirable. In addition, fusing of both line and neutral may be required (i.e. double fusing). For more information, see Hospital-Grade Power Entry Modules and “More Information on Hospital-Grade Products” on the Interpower website. Interpower offers free technical support. For more information to determine which kind of module is best for a specific product design, contact Customer Service. See the complete line of modules and fuses and fuse holders available at Interpower. See also "More Information on Power Entry Modules." © 2019 Interpower. All Rights Reserved. | Interpower and the "I" logo are registered trademarks of Interpower.